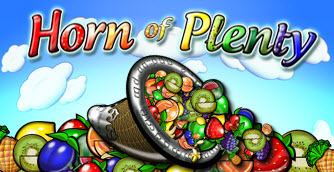 Overview: Horn of Plenty - a 50 line, 5 coin classic slot is the sumptuous new release from BETONSOFT with a wild, a scatter and a mouth-wateringly good free spins feature. 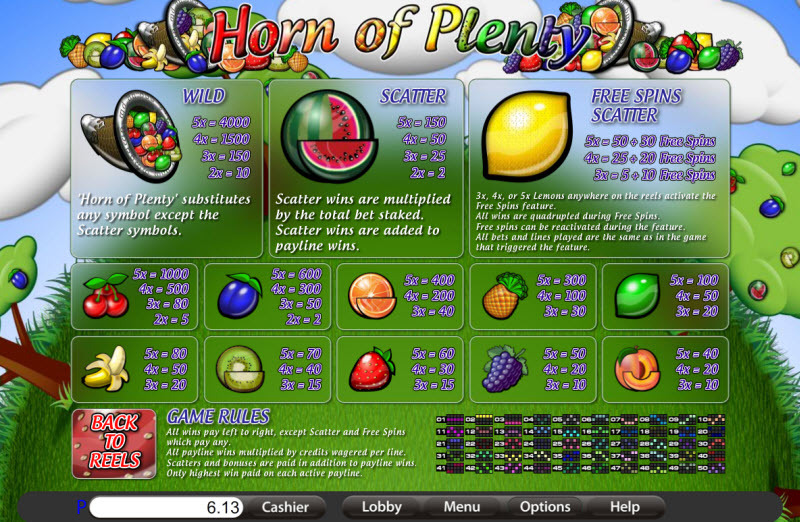 Players will get more from their recommended daily fruit serving with Horn of Plenty as these ripe, delicious fruit pack so much more punch than a healthy dose of Vitamin C.
The Horn of Plenty symbol is the Wild and 5 of these on your pay line will result in a tasty payout of 4,000 coins. 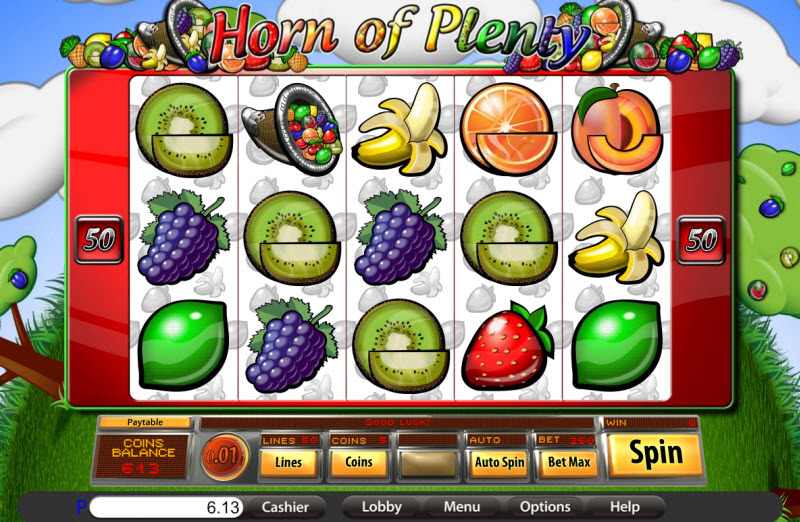 The Watermelon is the scatter symbol and 2 or more will multiply wins, but it's the zesty lemon that will attract a lot of smiles as 3, 4 or 5 of these symbols anywhere on the reels will trigger the free spins feature. You can win up to 30 free spins with a 4x multiplier and the free spins feature can be reactivated during free spins play. The cherry on top? Horn of Plenty yields a tasty maximum payout of 37,500 coins. If sweetness and freshness are what makes a fruit basket irresistible, then this juicy offering from BETONSOFT with its vivid, crystal clear graphics combined with tantalising features is worth sinking your teeth into. Similar Slots: If you like Horn of Plenty, you might like these other slot machines from Saucify: Arcadia:i3D, Buck$y Malone, Legends of Avalon - Progressive, NASCASH, Roll Up! Roll Up!, Tomahawk.